It is rare in sports that a player achieves such status that no one will argue their place in history. Sure, most people think that Michael Jordan is the greatest basketball player of all time, but it is not unanimous. Some might say Kobe Bryant, LeBron James, Bill Russell or others. Likewise in football, various different players such as Jerry Rice or Joe Montana can lay claim to being the best at what they did, but there will always be debate. Those debates is what makes Mariano Rivera so amazing. No right-minded person would even consider another closer as being in the same league as Rivera – he is, by far, the best to ever do the job. There is no need to list all of Mo’s accomplishments here – there are well known by now. With five rings, the most saves of all time, and one of the most devastating pitches ever delivered, Mariano will never be forgotten. That pitch, of course, is the famous cutter that Mo developed early in his career and made him what he is. It would slide across the plate from right to left, running away from right handed batters and sawing off the hands of lefties. Rivera was the rare reliever who was effective against both right and left handed hitters, so he was reliable no matter who was due up for the opposition. Since closers are penciled in for the ninth inning each time that a team has a lead, much of his success can be attributed to the fact that he was platoon-proof. While Mariano Rivera has not been his usual bullet-proof self for the Yankees in 2013, he will still ride out as one of the most-loved Yankees ever and a surefire first ballot Hall of Famer. The Yankees will likely miss the playoffs in 2013, and Mo will ride off into the sunset with his various gifts from teams around the league and a legacy unlike any other. 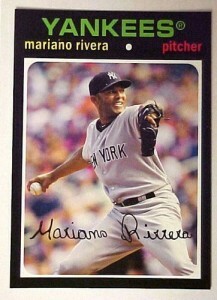 When it comes to Mariano Rivera memorability, you really can’t go wrong. Autographed balls, photos, cards, and more are all likely to gain in value as the years go by. Getting your hands on early Rivera products from the 1994-1996 time frame would be ideal, but any item will make a nice addition to a collection. Rivera began his career as a starting pitcher, so getting any collectibles that identify him in that way will make a special addition to your case. For baseball historians, collecting all of the ‘Core Four’ Yankee players (Rivera, Posada, Jeter, Pettitte) will make sure that a major portion of baseball history is represented in your collection. Consider yourself lucky that you had the opportunity to see Mariano Rivera weave his magic against so many opponents through the years. Mo wasn’t perfect, including blowing the save in game seven of the 2001 World Series, but he was as close as any closer has ever been. The only thing more rare than a major league pitcher succeeding with just one pitch, as Mariano did for his entire career, is a player being a fully-accepted as the greatest of all time at what he did. Mariano Rivera did both of those things, and will be a part of baseball history forever. 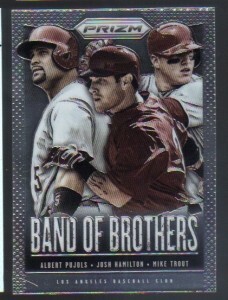 Ted Williams, Barry Bonds….Raul Ibanez? 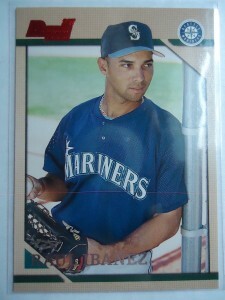 Raul Ibanez has had an impressive major league career, all things considered. While never a star player, Ibanez recently hit his 300th career home run during his third stint with the Seattle Mariners. With that homer, Ibanez becomes just the 137th player in baseball history to reach that total. No matter what the category, adding your name to a baseball list that has less than 150 members is impressive to say the least. When Ibanez retires, whether after this season or next, no one will be calling for him to enter the Hall of Fame – however, it will be able to walk away knowing he got the absolute most possible out of his ability. This 2013 season has been of particular note because of the home runs that he has racked up. Playing in 119 games for the Mariners, Ibanez has hit 29 home runs with a week left to play in the season. No player aged 41 or older (Ibanez is currently 41) has ever hit 30 home runs in a major league season. If he is to reach that mark in one of the last six games, it will be an incredible achievement if only for the names he has passed on the list. The top single-season home run leaders 41 years or older include Ted Williams, Barry Bonds, Dave Winfield, Stan Musial, Carlton Fisk, and more. Raul Ibanez is not a name that fits in with the rest – but there he is none the less. Due to a consistently low on base percentage and downright terrible defense, the value Ibanez brings to a team has always been limited. He has had his moments in the spotlight, though, most notably in the 2012 playoffs when he came up clutch for the Yankees in several key situations. More than just a home run hitter on the field, Ibanez has long been noted for his leadership, community service, and overall positive influence on the game of baseball. Despite being a great guy and racking up solid home run totals, no one is going to be clamoring for Raul Ibanez collectibles anytime soon. You could take a key from this list though and build a collection of cards and other items from the later seasons of the stars that have had big home run years late in their careers. Obviously anything Ted Williams is always attractive, but even Carlton Fisk, Stan Musial, and Barry Bonds could all comprise an exciting and valuable collection. Tracking down cards that represent the later years in these players’ careers would provide a fun challenge, but one that is more doable than finding rooking cards or other, more common targets. Raul Ibanez has had a unique career that all young players could learn from. He was cast off from team to team early on, and rarely got many at-bats. He continued to work, improved his swing and his fitness, and eventually made a lot of money and achieved great things in the game that he loves. That kind of persistence is what makes up a successful professional athlete, and Raul Ibanez will be able to retire feeling good about himself and his career.